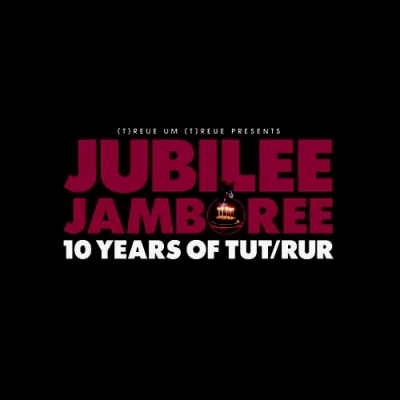 Jubilee compilation celebrating the 10 years of (t)reue um (t)reue's existence since the label's first release (Wermut's "Hoffnung") in February 2005! This V/A follows the same conceptual pattern as the TuT/RuR "tribute" compilations. Each artist has been invited to choose another artist's song from the label's roster and cover, remix, or re-interpret it to his heart's content. Join the carnival and rediscover 23 TuT/RuR classics in unexpected and exciting new disguises! a4 LO†PH - Kosovo, Zippo & Co.
TEATRO SATANICO "Pan ist Tod"
BRUTA NON CALCULANT "La que Sabe"
BRUTA NON CALCULANT "World In A Tear"
TZII "Sand Haert Rage "
BURIAL HEX "Bach Eingeschaltet ‎– Fünfter Band"
ALONE "Fossilized in Concrete 1995-2006"
WERMUT "Les Nuits Dalmates (Nouvelles agapes post-néoistes)"
TEATRO SATANICO "Inno a Satana"